Two well-wrought engines, including a torqued-up turbodiesel, as well as a posh cabin, sporty performance and handing, and an abundance of cargo space have Volkswagen feeling fine about its 2012 Jetta SportWagen. Tight rear seating and a burdensome price tag on the Jetta TDI indicate that VW still has work to do in improving this compact wagon model. Volkswagen has, thank heaven, allowed its 2012 Jetta SportWagen to retain the heady Euro-style elegance and performance that once characterized the sedan versions. Both the gas and turbodiesel powerplants, as well as the car's confidence-inspiring agility play well with back roads and highways, while the huge cargo capability of this versatile VW allows it to tote stuff most small wagons can only dream about. Bottom line, this family-friendly Jetta wagon is well worth a test drive. Much has been made of the decline of the next-gen Volkswagen Jetta sedan to better fit the perceived earthiness of average U.S. consumers. Well, the 2012 VW Jetta SportWagen will have none of that. More like its Golf forebears, this 5-passenger, 5-door compact wagon hangs on to the high-end interior ambiance and the heady Euro-style driving demeanor that put the Golf – and, once upon a time – the Jetta sedan a notch above the ordinary. Throw in an available torque-laden turbodiesel with nearly hybrid-like mileage figures, as well as a standard 6-speed stick shift in the base and TDI trims and nearly 67 cubic feet of cargo space with the rear seats folded (more than some midsize SUVs) to behold a Volkswagen with admirable family values. Unfortunately, this compact hauler is not quite perfect. According to nearly all reviewers and many owners, the rear seats are a tad cramped, and cabin storage, though adequate, could be better, while a set of pesky aft roof pillars plays havoc with rearward visibility, with no rear-view camera or even parking sensors available. Once again, for 2012, the Jetta SportWagen comes in three basic trims. The S is now delivered with a standard, silky smooth 6-speed manual transmission that replaces last year’s 5-speed stick shift, while the turbodiesel TDI and high-end SE trims continue to offer the sort of standard amenities that make this VW a niche-defying, well-endowed and supremely capable wagon for both the loyalist and the newbie. An available power glass sunroof results in the S, TDI and SE w/Sunroof sub-trims, and a hard-drive-based navigation system begets the TDI w/Navigation offspring. Many of these goodies can be had for a comfy base MSRP of around $21,100 for the S trim. Choosing the TDI will, however, set owners back considerably more in initial cost. Alas, all Jetta SportWagen trims are front-wheel-drive (FWD) only, with no all-wheel- or four-wheel-drive configurations planned for the near future. Perhaps the closest competitor, design-wise, to the 2012 Jetta SportWagen is Volvo’s classy V50. Though its handling, acceleration and overall refinement somewhat overshadow VW’s more generic offering, the V50 also costs considerably more. Other rivals include the Honda CR-V compact crossover, Mazda’s capable MAZDA3 hatchback, and now, the much ballyhooed Toyota Prius V hybrid wagon. Should a day of kicking compact wagon, hatchback or crossover tires be in order, however, certainly some of those tires ought to belong to the Jetta SportWagen. Praise be that the Jetta sedan’s underperforming, gasoline-burning inline 4-cylinder (I4) engine is not included among the choice of 2012 Jetta SportWagen powerplants. Instead, a much more competent 2.5-liter inline 5-cylinder (I5) gas engine drives the S and SE trims. Combined with the standard 6-speed manual transmission in the base S and the standard 6-speed shiftable automatic that graces the SE, the five-banger puts out 170 hp at 5,700 rpm and 177 lb-ft of torque at 4,250 rpm. The S trim can also be delivered with the shiftable automatic, which includes a driver-selectable sport mode that can add a bit of European flair to the commute. Mileage with the 6-speed stick shift is estimated at 23 mpg city/33 highway, while the 6-speed shiftable automatic is estimated at 24/31. Of course, the five-banger is perfectly content burning regular unleaded fuel and can be tweaked to conform with strict California emissions standards as well, thus earning the S and SE partial-zero-emissions-vehicle (PZEV) status. As its name implies, the Jetta SportWagen TDI features a capable and economical 2.0-liter, direct-injected I4 turbodiesel engine. The turbodiesel mates with either a 6-speed manual transmission or the highly touted DSG 6-speed shiftable auto-manual transmission, again with the selectable sport mode. Geared either way, this little turbodiesel throws down a rather tame 140 hp at 4,000 rpm that’s bolstered by a green-light-launching 236 lb-ft of torque at 1,750 rpm. Mileage with the stick shift works out to an impressive 30/42, while the DSG auto-manual drops mileage to a still wallet-friendly 29/39. Virtually all reviewers claim that the 2.5-liter I5 performs just fine in all driving situations, with the S trim’s standard 6-speed stick shift giving this base wagon noticeably more giddy-up from a stop. However, according to the majority of reviews, climbing the gears in the shiftable auto-manual is way more efficient, effective and fun than merely letting the shifter do all the work. Though the TDI’s manual transmission boasts a smooth throw and hassle-free clutch, reviewers cite a tendency in the stick-shift turbo to bog down at lower engine speeds, though acceleration improves markedly over 2,000 rpm. One test of the TDI with the manual transmission resulted in a 0-60 time of 8.9 seconds, while reviews note that the DSG auto-manual will be just a beat or two slower. Finally, all reviewers mention a moderate turbo-lag in the TDI trim, with most claiming little impact on overall performance. Sporting a front independent suspension complemented by MacPherson front struts, the 2012 Jetta SportWagen also keeps the laudable multi-link rear suspension system that has been replaced by the less effective torsion bar rear end in its sedan siblings. Add a stabilizer bar in both the front and rear, and this compact wagon delivers a surprisingly agile, some even say sporty drive. Steering is described as tight and true, but reviewers cite a noticeable amount of body lean in tight corners that detracts just a bit from the SportWagen’s overall handling capabilities. Brakes, on the other hand, are lauded by all reviewers as powerful and reliable, with no pedal anomalies. The Jetta SportWagen S trim rolls on 16-inch steel wheels, and sunroof/navigation-less TDI and the SE without sunroof each mount 16-inch alloy wheels. 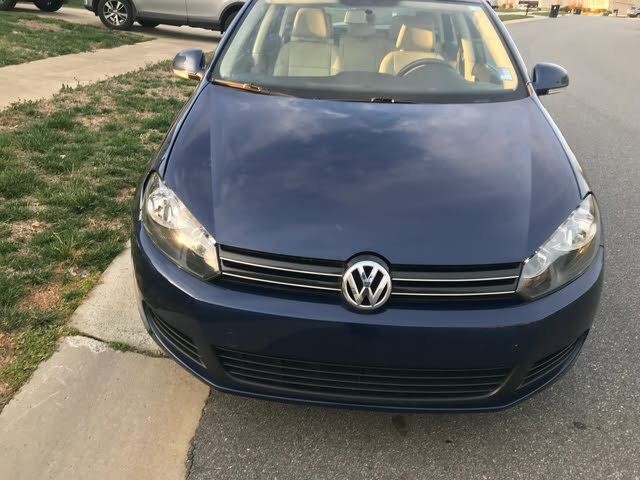 The SE w/Sunroof and the TDI w/Sunroof and/or Navigation sport standard 17-inch alloy wheels, and all trims ride on all-season radial tires. No matter the wheel size, this compact wagon is complimented by a majority of reviewers for its compliant ride on all but the most egregious of rough roads. All in all, reviewers agree that the 2012 Jetta SportWagen, in remaining true to its Golf roots, provides a much more engaging drive and a far cushier ride than do its sedan siblings. Quiet and smooth, this little wagon is lauded as an embodiment of its Germanic tradition. In another demonstration of superiority over its now-plebian sedan brethren, the 2012 Jetta SportWagen presents a vision of appealing exterior design and nearly posh cabin ambiance and comfort. The base SportWagen S, for instance, offers such standard goodies as a roof rack, cloth upholstery, heated 6-way power-adjustable front seats, fold-flat front passenger seat and a folding pass-through rear center armrest, just for starters. Then there are a number of thoughtful amenities like standard remote power door locks, power windows and heated, power-adjustable outside mirrors, as well as telescoping tilt-wheel steering, cruise control, air conditioning and a trip computer. Entertainment, meanwhile, is furnished by an MP3-capable single-CD player with 8 speakers, and communications are via phone pre-wiring and a standard Bluetooth hands-free data link. Options consist of the aforementioned power sunroof that results in the S w/Sunroof variant, as well as carpeted front and rear floor mats, a rear spoiler, splash guards and 16-inch alloy wheels. Moving up to the high-end SE and TDI trims will gain owners some added posh, with standard leatherette upholstery, a leather steering wheel with mounted audio controls and a leather-trimmed shift knob. A standard, MP3-compatible 6-CD player with 10 speakers and Sirius satellite radio, as well as an auxiliary iPod interface, memory card slot and a USB connection also come with the each of the top-shelf trims. While both trims are eligible for all options available to the S, the TDI can additionally be equipped with a voice-activated, hard-drive-based navigation system, though it loses the 6-CD changer in favor of the simpler single-CD player. Reviews laud the 2012 SportWagen’s welcoming cabin, though one or two lament a lack of adequate cabin storage despite a shallow under-floor rear storage bin. Controls are well-placed for the most part, and gauges are legible in daylight, though a number of reviews claim that dashboard backlighting is too soft for easy readability at night. Some added cabin detail, such as chrome trim and brushed-metallic accents, is praised by reviewers for injecting a little extra class into an already well-wrought cabin. If there’s an area where the SportWagen’s cabin falls short, however, that would be in its less-than-commodious rear seating. Most reviewers submit that the rear seats, though comfy enough, should be limited to two adults, while kids will obviously have an easier time of it. All in all, reviews consistently rate the Jetta SportWagen cabin far superior to that of its sedan siblings. The 2011 Jetta SportWagen is rated a Top Safety Pick by the Insurance Institute for Highway Safety (IIHS). It earns this distinction by having the highest score of Good in both front and side impact testing, as well as in roof strength tests. Expect the relatively unchanged 2012 version to once again grab top safety honors from all government testing agencies, including the National Highway Traffic Safety Administration (NHTSA). The basis for this compact wagon’s consistently high marks lies in its standard traction control and electronic stability control (ESC), not to mention front and rear head airbags, dual front side-mounted airbags and front head-restraint whiplash protection. Of course, the 4-wheel antilock braking system (ABS) with electronic brakeforce distribution and emergency braking assist is also standard across the lineup, as are daytime running lights and turn-signal-integrated mirrors. A post-collision safety system and remote antitheft alarm are also among the 2012 SportWagen’s laudable standard safety features. Cramped rear seating, sparse options offerings and some distressing glitches in a few of the standard techno-goodies top the list of owner complaints about both the 2011 and 2012 Jetta Sportwagen lineups. 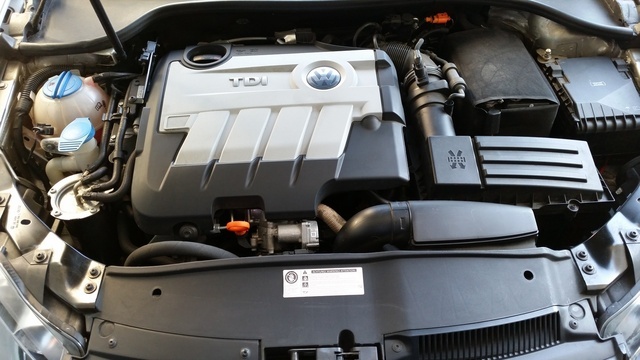 That pesky turbo lag in the TDI trim, a few minor wheel and tire issues and a number of complaints about inadequate cabin storage also bring cause for some owner dissatisfaction. Mileage in the TDI’s turbodiesel, on the other hand, encourages a heap of praise from virtually all owners of this particular trim, while performance characteristics of both the turbodiesel and the five-banger also draw a ton of owner kudos. 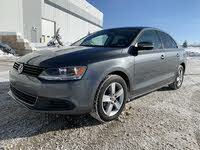 Owners also laud the Jetta SportWagen for its looks, handling prowess, performance, build quality and cabin ambiance. Finally, this compact wagon doesn’t disappoint with its hefty cargo capacity, and its enviable safety record has a whole lot of families well satisfied with their choice. What's your take on the 2012 Volkswagen Jetta SportWagen? vadertime We just bought a used 2012, Jetta Sportwagen TDI (April 2015). 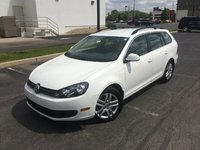 We traded in our beautiful 2007 Passat Sportwagen with 2.0T. That car was a rocket with it's 200hp turbo. However, despite being in excellent condition and only 70,000 miles, things were beginning to break or wear out. So, we thought we would look for a replacement wagon, which was obviously going to be another VW. We looked at both the gas and diesel models including a new, 2014 diesel, on which unfortunately we couldn't reach a deal. I also missed out on a used 2014 gas wagon due to logistics. I guess things work out in the end, because we got the trade-in allowance on our old Passat and got a "gently-used" TDI Jetta wagon. It'll be fun to see how well the TDI performs over the next few years. Kevin I have been very happy with my 2012 2.5 Sportwagen. 5 years 80,000 miles and only problem I have had is broken rear springs. Most likely caused by my overloading when camping and generally treating this vehicle like a full sized SUV. Happy with the purchase just hope it doesn't get too lonely now that its TDI siblings are being taken out to the back pasture to be put out of their misery. Have you driven a 2012 Volkswagen Jetta SportWagen? How do you give "stars" to car dealers. what does this mean... easy to deal with, "pack a lunch type" for negotiations, pricing,honesty.